For other uses, see 2017 World Series (disambiguation). The 2017 World Series was the championship series of Major League Baseball's (MLB) 2017 season. The 113th edition of the World Series, it was played between October 24 and November 1. The series was a best-of-seven playoff between the National League (NL) champion Los Angeles Dodgers and the American League (AL) champion Houston Astros. It was sponsored by the Internet television service YouTube TV and officially known as the 2017 World Series presented by YouTube TV. The Astros defeated the Dodgers, four games to three, to win their first World Series in franchise history, also becoming the first team from Texas to do so. It was the first time since 2001-2002 when two consecutive World Series went to seven games. Both teams set a World Series record with a combined total of 25 home runs throughout the entire series, including a team record 15 home runs by the Astros, and hit a combined total of eight home runs in Game 2 to set the single game World Series mark. 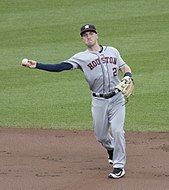 Houston outfielder George Springer was named as the World Series Most Valuable Player (MVP) after hitting five home runs in the series to tie a World Series record with Reggie Jackson in 1977 and Chase Utley in 2009. This was the first World Series in which home-field advantage was decided by the regular season record of the two pennant winners. From 1903 to 2002, home-field advantage had been determined by coin flips and by alternating between the AL and NL. [a] From 2003 to 2016, it was determined by results from that season's All-Star Game, when it was awarded to the team from the winning league. The Dodgers earned home-field advantage over the Astros. The series was played in a 2–3–2 format, with the Dodgers hosting Games 1, 2, 6, and 7; and the Astros hosting Games 3, 4, and 5. This was the first World Series matchup, and second postseason meeting overall, between the Astros and Dodgers. Los Angeles defeated Houston in the 1981 National League Division Series in five games en route to its World Series championship that year. The teams also met in the 1980 National League West tie-breaker game. This was the first Fall Classic since 1970, and the eighth overall, in which both participants had 100 or more wins during the regular season. The two teams did not meet in interleague play during the regular season. The Dodgers held a 91–36 record through August 25 and ended the season with a 104–58 record. They won their fifth consecutive National League West title and home field advantage throughout the playoffs as the overall #1 seed. In the postseason, the Dodgers swept the 4th-seeded Arizona Diamondbacks in the National League Division Series and then defeated the number 3 seed and defending World Series champion Chicago Cubs in the previous year's rematch of the National League Championship Series in five games. This was the first appearance in the Fall Classic for the Dodgers since 1988, the tenth since the franchise moved from Brooklyn to Los Angeles in 1958, and the 19th overall. Entering the 2017 World Series, the Dodgers bullpen had thrown 23 consecutive scoreless innings, a postseason record for a bullpen. Additionally, by outscoring the Arizona Diamondbacks and Chicago Cubs by a combined 48–19 margin, the Dodgers entered the World Series with the third-best run differential of any pennant winner since the playoff structure was expanded in 1995. All-Star shortstop Corey Seager, who was out for the entire National League Championship Series with a back injury, was included on the Dodgers' World Series roster. Manager Dave Roberts became first manager of Asian heritage ever in the World Series, as well as the fourth African-American manager. With a 101–61 regular season record, the team won its first American League West title, their first division title since 2001, and the #2 seed in the AL. [b] In the American League Division Series, they defeated the 3rd-seeded Boston Red Sox in four games and then defeated the 4th-seeded New York Yankees in the American League Championship Series (ALCS) in seven games. This was their second World Series appearance and first since 2005, when they were swept in four games by the Chicago White Sox. They became the first team in history to make it to the World Series as members of both the National League and the American League. The city of Houston in August 2017 suffered record flooding from Hurricane Harvey. The team began to wear patches which had the logo of the team with the word "Strong" on the bottom of the patch, as well as promoting the hashtag Houston Strong. Manager A. J. Hinch has stated in an interview that the team wasn't just playing for a title, but to help boost moral support for the city. On August 31, just seconds before the midnight deadline, the Astros traded for Detroit Tigers pitcher Justin Verlander. Following the trade, including the regular season and postseason to this point, Verlander had posted a 9–0 win–loss record with a 1.23 earned run average. He was named the ALCS MVP. Houston won the series, 4–3. Game 1: The ceremonial first pitch was thrown out by members of former Dodger Jackie Robinson's family, including his widow Rachel. The game marked the 45th anniversary of Robinson's death, and the 2017 season was the 70th anniversary of his breaking of the baseball color line. Keith Williams Jr., a gospel singer, performed "The Star-Spangled Banner", the national anthem. Game 2: Fernando Valenzuela threw out the ceremonial first pitch to Steve Yeager; both were introduced by retired Dodgers broadcaster Vin Scully. Country music's Brad Paisley performed the national anthem. Game 3: Houston Texans defensive end J. J. Watt, who had raised $37 million for Hurricane Harvey victims, threw out the first pitch. The ball was given to him by Astros' Hall of Famer Craig Biggio. The national anthem was performed by Texas Air National Guard Master Sergeant Promise Harris. Game 4: Hailey Dawson, a seven-year-old girl from Nevada, threw out the ceremonial first pitch using a 3D printed hand. The national anthem was performed by the Houston Police Department Quartet. Game 5: Former President of the United States George W. Bush threw out the ceremonial first pitch. His father, former President George H. W. Bush handed him the ball. Justin Verlander caught the pitch. Country singer Clay Walker performed the national anthem. Game 6: Orel Hershiser and Tommy Lasorda, celebrating the Dodgers' 1988 World Series title, each threw out the ceremonial first pitch. Los Angeles Police Department (LAPD) officer Rosalind Curry performed the national anthem. Game 7: The LAPD Quartet sang the National Anthem. The first pitch was thrown out by Sandy Koufax. Rick Monday, Steve Garvey and Don Newcombe participated as well. The temperature at the start of the game was 103 °F (39 °C), which made this the hottest World Series game ever recorded. Clayton Kershaw started Game 1 for the Dodgers, while Dallas Keuchel started for the Astros. Chris Taylor hit a home run for the Dodgers on Keuchel's first pitch of the game. It was the third home run to leadoff a game in Dodgers postseason history (following Davey Lopes in 1978 World Series and Carl Crawford in 2013 NLDS). Alex Bregman hit a tying home run for the Astros in the fourth inning. In the sixth inning, Justin Turner hit a go-ahead two-run home run for the Dodgers. Turner tied Duke Snider for most career runs batted in (RBIs) in Dodgers postseason history with 26. Kershaw struck out 11 in seven innings pitched with no walks and only three hits allowed while Keuchel allowed three runs on six hits in ​6 2⁄3 innings. Brandon Morrow pitched a scoreless eighth and Kenley Jansen earned the save. The two-hour, 28-minute game was the shortest World Series contest since Game 4 in 1992. The starting pitchers for Game 2 were Rich Hill for the Dodgers and Justin Verlander for the Astros. The Astros scored first when Bregman drove in Josh Reddick with a hit in the third inning. Hill struck out seven in four innings but was replaced by Kenta Maeda in the fifth. Joc Pederson tied the game with a home run in the bottom of the fifth inning, and the Dodgers took the lead when Corey Seager hit a two-run home run in the bottom of the sixth inning. Verlander allowed two hits, both home runs, in his six innings pitched. Carlos Correa drove in the Astros' second run of the game on a single in the eighth, ending the Dodgers bullpen's streak of 28 consecutive scoreless innings in the postseason. Marwin González hit a home run off Jansen in the ninth to tie the game. This was only Jansen's second blown save all season and snapped his streak of converting his first 12 postseason save opportunities, a major league record. The game went into extra innings. José Altuve and Correa hit back-to-back home runs off Josh Fields in the tenth inning to put the Astros in the lead. Yuli Gurriel doubled after the home run, but Fields was replaced by Tony Cingrani and Gurriel wa stranded In the bottom of the inning, Yasiel Puig hit a 2-run home run off of Ken Giles and Enrique Hernández drove in Logan Forsythe, who had walked, to tie the game, with the latter being the Dodgers' first run that was not driven in by a home run. In the next inning, pinch-hitter Cameron Maybin singled and stole second.George Springer hit a two-run home run for the Astros off of Brandon McCarthy to retake the lead. In the bottom of the 11th inning, Charlie Culberson homered off of Chris Devenski, who later struck out Puig to end the game. This was the first ever World Series game in which a team hit home runs in the ninth, tenth and eleventh inning. The teams set a new record for combined home runs in a single World Series game with eight and this was the first time in MLB history, regular season or postseason, that five home runs were hit in extra innings. The Astros won their first World Series game in franchise history as they had been swept in their previous appearance in 2005. The starting pitchers for Game 3 were Yu Darvish for the Dodgers and Lance McCullers Jr. for the Astros. The Astros scored four runs in the bottom of the second inning on a home run by Yuli Gurriel and RBIs by González, Brian McCann, and Bregman. Darvish left the game after ​1 2⁄3 innings, which was the shortest outing of his career. The Dodgers scored one run in the top of the third inning as Seager grounded into a double play after McCullers loaded the bases with three consecutive walks. The Astros added another run in the fifth on an RBI single by Evan Gattis and the Dodgers added two in the sixth on an RBI groundout by Puig and a wild pitch. McCullers wound up pitching 5​1⁄3 innings and allowed three runs on four hits. Brad Peacock replaced McCullers, completing the final ​3 2⁄3 innings with no hits allowed and four strikeouts to earn his first major league save. It was the longest hitless World Series relief outing since Ron Taylor's four innings in Game 4 of the 1964 Series, and tied Ken Clay for the longest hitless postseason save, first accomplished in the 1978 ALCS. Gurriel made a racially insensitive gesture in the dugout after his home run. He stretched the sides of his eyes and mouthing the Spanish word chinito, which translates to "little Chinese Boy"; Darvish is from Japan. Gurriel apologized, and said that anyone from Asia is called a chino in Cuba, although he acknowledged knowing that the term was offensive in Japan from having played there. As a result, Rob Manfred, the Commissioner of Baseball, suspended Gurriel for the first five games of the 2018 MLB season without pay, but allowed him to continue playing in the World Series. Joc Pederson hit a three-run home run in Game 4. The starting pitchers for Game 4 were Alex Wood for the Dodgers and Charlie Morton for the Astros. Springer homered off Wood in the bottom of the sixth for the first run of the ballgame. It was the only hit Wood allowed in ​5 2⁄3 innings pitched in the game. Forsythe drove in Cody Bellinger to tie the game in the top of the seventh. Morton struck out seven and only allowed three hits and one run in 6​1⁄3 innings. Bellinger then drove in the go-ahead run with a double in the top of the ninth off of Giles and the Dodgers added four more runs on a sacrifice fly by Austin Barnes and a three-run homer by Pederson. Bregman hit a home run off of Jansen in the bottom of the ninth inning, but the Dodgers won the game to even up the series. The Astros had two hits in the game; both were home runs. This was the first game in World Series history where both starting pitchers allowed four or fewer baserunners. After Game 4, both teams' pitching coaches, Rick Honeycutt for the Dodgers and Brent Strom for the Astros, commented on how the baseball being used for the World Series is slicker than the baseball used during the regular season. Pitchers on both teams noted that this difference has made it more difficult for them to throw their sliders. Alex Bregman drove in the game-winning run in Game 5. Kershaw and Keuchel started Game 5, in a rematch of the opening game of the series. Forsythe singled in two runs off of Keuchel in the first inning to put the Dodgers up early. A third run scored on a throwing error by Gurriel. Barnes singled in the fourth to score Forsythe. Keuchel pitched ​3 2⁄3 innings for the Astros, allowing five hits and four runs (three earned). The Astros scored their first run with an RBI double by Correa in the bottom of the fourth inning, followed by a three-run home run by Gurriel to tie the game. Bellinger hit a three-run home run off of Collin McHugh in the top of the fifth to put the Dodgers back on top only for Altuve to hit his own three-run home run in the bottom of the inning off Maeda to tie it back up. 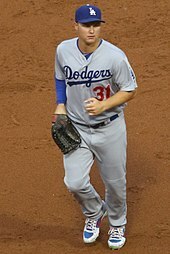 Kershaw pitched 4​2⁄3 innings and allowed six runs on four hits and three walks. A triple by Bellinger on a line drive that Springer missed on a dive in the seventh inning off of Peacock scored Hernández from first base. In the bottom of the seventh inning, Springer hit a home run off the first pitch he saw off of Morrow, who was pitching for the third consecutive day, to tie the game. Bregman scored on a double by Altuve to put the Astros ahead for the first time in the game, and then Correa hit a two-run home run to extend the lead. Seager doubled in a run in the top of the eighth inning, but McCann hit a home run in the bottom of the inning. That was the 21st home run of the series, tying the record set in the 2002 World Series. Puig broke the record with a two-run home run in the top of the ninth inning. Down to their last strike, Chris Taylor drove in Barnes to tie the game with a single. In the tenth inning, McCann was hit by a pitch to put him on base with two outs. Subsequently, Springer walked on five pitches to move McCann to second base. McCann was then replaced by pinch runner Derek Fisher. On the next pitch, Bregman hit a walk-off single, scoring Fisher with the winning run. The Astros became only the second team to come back twice from three runs down in a World Series game, the other was the Toronto Blue Jays in the 15–14 win during Game 4 of the 1993 World Series. The six game tying home runs in the series to this point is the most for any World Series on record. This World Series set a new record for most players to hit a home run (14 to date in the World Series). With the teams combining to score 25 runs throughout the game, this was the highest scoring World Series game since the Florida Marlins defeated the Cleveland Indians 14–11 in Game 3 of the 1997 World Series. Game 5 lasted five hours and seventeen minutes, making it the second longest World Series game in history by time. 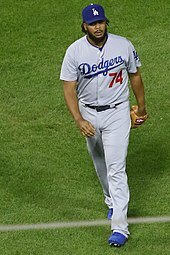 Kenley Jansen recorded a two-inning save in Game 6. Game 6 featured the same starting pitchers as the second game: Verlander and Hill. Springer hit a home run off of Hill in the top of the third for the first run of the night. It was Springer's fourth homer of the series, tied for third all-time in a single series and joining Gene Tenace, in 1972, as the only players with four game-tying or go-ahead home runs in a World Series. Springer also joined Hank Bauer in the 1958 World Series and Barry Bonds in the 2002 World Series with four home runs in a series. The Astros loaded the bases in the fifth inning, but did not score. Hill pitched ​4 2⁄3 innings, struck out five and allowed four hits and one run. In the sixth inning, Taylor tied the game with an RBI double and Seager hit a sacrifice fly to give the Dodgers the lead. Verlander pitched six innings with nine strikeouts and only three hits allowed. Pederson hit a home run in the bottom of the seventh inning and Jansen pitched two scoreless innings for the save. Pederson tied a World Series record with his fifth consecutive game with an extra base hit. Andre Ethier, who appeared in the game as a pinch hitter, set a new Dodgers franchise record with his 50th career postseason game. George Springer hit his fifth home run in Game 7, tying the World Series record. This was the first World Series Game 7 to be played at Dodger Stadium (and the first postseason Game 7 of any postseason series at the stadium since the 1988 NLCS, and the Dodgers' first World Series Game 7 since 1965 against the Minnesota Twins). It was also the first time since the 1931 World Series that a Game 7 occurred in a Series with both teams having won at least 100 games during the season. Besides, this was the first time since the 2001 World Series and 2002 World Series that back-to-back Fall Classics had a Game 7. The starting pitchers for this game were the same as in the third game: McCullers and Darvish. Springer doubled to open the game and scored the first run on an error by Bellinger, which allowed Bregman to reach second base. Bregman stole third base and scored on an Altuve groundout. McCann scored the next inning on a groundout hit by the pitcher McCullers. Springer hit a two-run home run, his fifth of the series, tying Reggie Jackson and Chase Utley for most home runs in a single World Series and setting a new record with 29 total bases in any postseason series. As in Game 3, Darvish lasted only ​1 2⁄3 innings (tying the shortest outing of his career) and became the third pitcher with two starts of less than two innings in a World Series, and the first since Art Ditmar in the 1960 World Series. Morrow relieved Darvish and in the process became only the second pitcher to pitch in all seven games of a single World Series, joining Darold Knowles in the 1973 World Series. McCullers lasted only 2​1⁄3 innings himself; he allowed three hits and hit a World Series record four batters. This was the first Game 7 in World Series history where neither starting pitcher got past the third inning. The Dodgers failed to score a run and left eight men on base through five innings. Andre Ethier hit a pinch-hit RBI single that scored Pederson in the sixth inning for the Dodgers' only run. They only had one hit in 13 chances with runners in scoring position in the game. Kershaw pitched four scoreless innings of relief in the game, and in the process, he broke Orel Hershiser's Dodgers postseason record with his 33rd strikeout. Morton pitched four innings of relief to earn the win, as Corey Seager grounded out to José Altuve, who threw to Yuli Gurriel to end the game, with the Astros winning their first championship in franchise history, and ending their 56-year drought. Springer won the World Series MVP Award. With the Astros' win, for the first time since 2002, when the Angels beat the Giants in seven games, a franchise won its first World Series title. After Game 7, the trophy presention, usually taking place in the locker room whenever the visiting team clinches the series, took place on the losing team's field for the first time ever before a small crowd of mostly Astros fans that remained as most Dodgers fans left the stadium. Correa proposed to his girlfriend, 2016 Miss Texas USA winner Daniella Rodríguez, on live television during a postgame interview conducted by Rosenthal. She accepted. 2017 World Series (4–3): Houston Astros defeated Los Angeles Dodgers. Winning player's share: $438,901.57. Losing player's share: $259,722.14. Fox broadcast the series in the United States, with Joe Buck serving as the play-by-play announcer, along with John Smoltz as color commentator and Ken Rosenthal and Tom Verducci as field reporters. For Fox Deportes, Rolando Nichols provided play-by-play while Carlos Álvarez and Edgar Gonzalez provided color commentary. Kevin Burkhardt hosted the pregame shows, joined by analysts Keith Hernandez, David Ortiz, Alex Rodriguez, and Frank Thomas. Outside the United States, MLB International televised the series, with Matt Vasgersian on play-by-play and Buck Martinez doing color commentary. According to Nielsen ratings, this series was the third highest rated since 2005, trailing only the 2009 World Series and the 2016 World Series. For the second straight year, a World Series game, Game 5, beat out NBC Sunday Night Football in ratings. ESPN Radio broadcast the series nationally in English, with Dan Shulman providing the play-by-play and Aaron Boone serving as color analyst. Tim Kurkjian and Buster Olney served as reporters for the network, while Marc Kestecher hosted the pre-game and post-game coverage along with analyst Chris Singleton. The ESPN Radio coverage was carried on affiliated stations throughout the United States and Canada, as well as online at ESPN.com and via the ESPN mobile app. Spanish-language coverage was provided by ESPN Deportes Radio, with Eduardo Ortega, Renato Bermúdez, José Francisco Rivera, and Orlando Hernández announcing. Locally, both teams' flagship radio stations broadcast the series with their regular announcers. Sportstalk 790 aired the English-language broadcast for the Houston area, with Robert Ford and Steve Sparks calling the games. In Los Angeles, AM 570 LA Sports aired the English-language broadcast, with Charley Steiner and Rick Monday announcing. In Spanish, Univision America 1020 carried the broadcast, with Jaime Jarrín and Jorge Jarrín on the call. In Korean, Radio Korea 1540 aired the series, with Richard Choi and Chong Ho Yim in the booth. For the first time, MLB sold presenting sponsorships to all of its postseason series; the internet television service YouTube TV is the first-ever presenting sponsor of the World Series. The series is officially known as the 2017 World Series Presented by YouTube TV. This sponsorship includes logo branding in-stadium and on official digital properties, as well as commercial inventory during Fox's telecasts of the games. This was Houston’s first sports championship since the Houston Dynamo won the MLS Cup in 2007. The Astros earned $30,420,155.57 from postseason pool money to split among team personnel; each share was worth $438,901.57. The Dodgers received $20,280,103.72, with shares of $259,722.14 The sportsbooks in Nevada lost $11.4 million in November 2017, a record for baseball-related betting. The city of Houston held a parade for the Astros on November 3, 2017, which Mayor Sylvester Turner proclaimed was "Houston Astros' Day". An estimated 750,000 to one million attended the parade. Springer and Altuve appeared on the cover of Sports Illustrated's November 13, 2017, issue, with Altuve holding the Commissioner's Trophy and Springer holding a copy of a Sports Illustrated from 2014 that predicted the Astros would win the 2017 World Series. The Dodgers would make another World Series appearance the following year in 2018, but lost to the Boston Red Sox in five games, marking the first time the Dodgers lost back-to-back World Series since 1977 and 1978, where they lost both World Series to the New York Yankees. 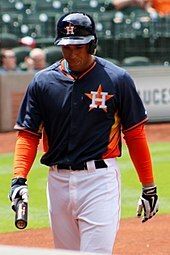 ^ The Astros moved to the American League West from the National League Central before the 2013 season. ^ Macklin, Oliver (October 24, 2017). "Davis named chief of World Series ump crew". Major League Baseball. Retrieved October 24, 2017. ^ "Astros, Dodgers complete record-setting World Series". ESPN. November 2, 2017. Retrieved November 2, 2017. ^ a b Castrovince, Anthony (November 1, 2017). "Springer swats his way to MVP honors". Major League Baseball. Retrieved November 2, 2017. ^ Schoenfield, David (November 2, 2017). "George Springer wins World Series MVP, ties record with five homers". ESPN. Retrieved November 2, 2017. ^ Nightengale, Bob (August 11, 2014). "1994 strike most embarrassing moment in MLB history". USA Today. Retrieved February 11, 2018. ^ Kelly, Matt (October 25, 2017). "The meaning of home-field advantage: For the first time in World Series history, Game 1 belongs to the team with the best record". MLB.com. Retrieved February 11, 2018. ^ Perry, Dayn (October 20, 2017). "Who has home-field advantage in the World Series? The Dodgers, and here's why: The process for determining home-field advantage in the World Series is different in 2017". CBS Sports. Retrieved February 11, 2018. ^ Whicker, Mark (October 22, 2017). "Whicker: Dodgers, Houston Astros try to rekindle their 80s rivalry". Orange County Register. Retrieved October 25, 2017. ^ Posnanski, Joe (October 24, 2017). "Dodgers, Astros renew rivalry in World Series". Major League Baseball. Retrieved October 25, 2017. ^ Kelly, Matt; Randhawa, Manny (October 22, 2017). "Astros-Dodgers joins 100-win Series history". Major League Baseball. Retrieved October 30, 2017. ^ Stephen, Eric (October 23, 2017). "Astros vs. Dodgers is the first World Series between 100-win teams in 47 years". SB Nation. Retrieved October 24, 2017. ^ Stephen, Eric (October 21, 2017). "Dodgers vs. Astros 2017 World Series snapshot". SB Nation. Retrieved October 24, 2017. ^ Stephen, Eric (August 22, 2017). "'Best team ever?' Dodgers make Sports Illustrated cover". SB Nation. Retrieved October 19, 2017. ^ Schoenfield, David (July 6, 2017). "Real or not? Best Dodgers team ever, Yankees in trouble". ESPN. Retrieved October 19, 2017. ^ Baxter, Kevin (September 22, 2017). "Dodgers clinch fifth consecutive NL West title with 4-2 victory over Giants". Los Angeles Times. Retrieved January 25, 2018. ^ Muskat, Carrie; Gurnick, Ken (October 19, 2017). "Hollywood & Vines: LA wins NLCS at Wrigley!". Major League Baseball. Retrieved October 19, 2017. ^ Hoornstra, J.P. (October 23, 2017). "The Dodgers in the World Series: a brief history". Orange County Register. Retrieved October 24, 2017. ^ McIntosh, Whitney (October 20, 2017). "Dodgers bullpen sets record for consecutive scoreless innings in a postseason". SB Nation. Retrieved January 25, 2018. ^ Paine, Neil (October 20, 2017). "The Dodgers Dominated Like Few Pennant Winners In Recent History". FiveThirtyEight. Retrieved October 20, 2017. ^ Baer, Bill (October 23, 2017). "Corey Seager will be included on Dodgers' World Series roster". NBC Sports. Retrieved October 23, 2017. ^ Walker, Rhiannon (October 11, 2017). "Dave Roberts can join Cito Gaston as the only black managers to win World Series". The Undefeated. Archived from the original on October 27, 2017. ^ a b Axisa, Mike (September 17, 2017). "Houston Astros clinch first AL West title, first division title overall since 2001: The Astros have their first division title since moving to the AL in 2013". CBS Sports. Retrieved January 25, 2018. ^ Woo, Jeremy. "McCullers throws 24 straight curves, sends Astros to series". Sports Illustrated. Retrieved October 22, 2017. ^ McIlvoy, Randy (October 23, 2017). "A look back: Astros 2005 World Series run". KPRC-TV. Retrieved October 26, 2017. ^ "World Series: Four facts that make the Astros-Dodgers clash historic". USA Today. October 22, 2017. Retrieved October 24, 2017. ^ "Tigers deal Justin Verlander to Astros in last-minute deadline stunner". USA TODAY. Retrieved November 4, 2017. ^ Baxter, Kevin (October 25, 2017). "Dodgers vs. Astros Game 2: A look at the pitching matchup between Rich Hill and Justin Verlander". Los Angeles Times. Retrieved October 26, 2017. ^ Kelly, Matt (October 21, 2017). "Verlander named ALCS MVP after superb starts". Major League Baseball. Retrieved October 21, 2017. ^ "Boxscore: Houston vs. Los Angeles, Game 1". Major League Baseball. Retrieved October 24, 2017. ^ "Boxscore: Houston vs. Los Angeles, Game 2". Major League Baseball. Retrieved October 25, 2017. ^ "Boxscore: Los Angeles vs. Houston , Game 3". Major League Baseball. Retrieved October 27, 2017. ^ "Boxscore: Los Angeles vs. Houston , Game 4". Major League Baseball. Retrieved October 28, 2017. ^ "Boxscore: Los Angeles vs. Houston, Game 5". Major League Baseball. Retrieved October 29, 2017. ^ "Boxscore: Houston vs. Los Angeles, Game 6". Major League Baseball. Retrieved October 31, 2017. ^ "Boxscore: Houston vs. Los Angeles, Game 7". Major League Baseball. Retrieved November 1, 2017. ^ McIntosh, Whitney (October 24, 2017). "Jackie Robinson's family threw out the first pitch for Game 1 of the World Series". SB Nation. Retrieved October 25, 2017. ^ Walker, Rhiannon (October 25, 2017). "Jackie Robinson's family tosses first pitch as Dodgers take Game 1 of World Series". The Undefeated. Archived from the original on October 29, 2017. ^ "World Series 2017: Gospel Singer Keith Williams Jr. Sings National Anthem at Game 1". Billboard. October 24, 2017. Retrieved October 29, 2017. ^ Rollins, Khadrice (October 25, 2017). "Watch: Vin Scully brings Dodgers legends for 1st pitch". Sports Illustrated. Retrieved October 26, 2017. ^ Markazi, Arash (October 25, 2017). "Beloved Scully delights Dodgers fans at Game 2". ESPN. Retrieved October 26, 2017. ^ Iasimone, Ashley (October 25, 2017). "World Series 2017: Brad Paisley Performs the National Anthem at Game 2". Billboard. Retrieved October 29, 2017. ^ McTaggart, Brian [@brianmctaggart] (October 26, 2017). "On Friday, Texans DL JJ Watt will throw out ceremonial first pitch and Hall of Famer Craig Biggio will deliver the game ball" (Tweet) – via Twitter. ^ "Houston Texans' J.J. Watt tosses first pitch at Game 3". ESPN. October 27, 2017. Retrieved October 27, 2017. ^ a b c Barron, David (October 27, 2017). "National anthem lineup set for World Series games at MMP". Houston Chronicle. Retrieved October 29, 2017. ^ "7-year-old with 3-D printed hand to throw out World Series first pitch". CBS News. October 27, 2017. Retrieved October 28, 2017. ^ "Game 4 first pitch tossed by young girl with prosthetic hand". ESPN. October 28, 2017. Retrieved October 28, 2017. ^ Spain, Kevin (October 26, 2017). "World Series: George Bush will throw out first pitch for Game 5 in Houston". USA Today. Retrieved October 29, 2017. ^ McIntosh, Whitney (October 31, 2017). "Dodger greats Tommy Lasorda and Orel Hershisher throw out ceremonial first pitch for Game 6". SB Nation. Retrieved November 1, 2017. ^ Schiff, Mark. "2017 World Series National Anthem singers". AXS. Retrieved November 1, 2017. ^ McIntosh, Whitney (November 1, 2017). "Sandy Koufax, Don Newcombe, Rick Monday, and Steve Garvey all showed up for Game 7's ceremonial first pitch". SB Nation. Retrieved November 2, 2017. ^ Jacobo, Julia (October 25, 2017). "103-degree heat shatters World Series record". ABC News. Retrieved October 25, 2017. ^ Varela, Ashley (October 22, 2017). "World Series Game 1 will feature Dallas Keuchel vs. Clayton Kershaw". NBC Sports. Retrieved October 25, 2017. ^ Stephen, Eric (October 24, 2017). "Chris Taylor leads off the World Series with a home run". SB Nation. Retrieved October 24, 2017. ^ "World Series 2017 Game 1: Houston Astros 1–3 Los Angeles Dodgers – as it happened". The Guardian. October 24, 2017. Retrieved October 25, 2017. ^ Doolittle, Bradford (October 24, 2017). "Kershaw aces Astros, rewrites October reputation in Dodgers' Game 1 win". ESPN. Retrieved October 25, 2017. ^ Gurnick, Ken; McTaggart, Brian (October 24, 2017). "Red hot! 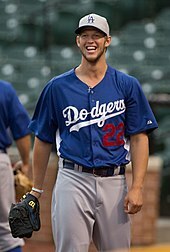 Turner HR backs Kershaw Gm. 1 gem". Major League Baseball. Retrieved October 24, 2017. ^ a b Hoffman, Benjamin; Waldstein, David (October 25, 2017). "World Series 2017: Dodgers vs. Astros Game 2 Live Updates". The New York Times. Retrieved October 25, 2017. ^ Gurnick, Ken (October 26, 2017). "Resilient Dodgers putting loss behind them". Major League Baseball. Retrieved October 26, 2017. ^ Marchand, Andrew (October 25, 2017). "Astros' stars stage stunning comeback to even World Series". ESPN. Retrieved October 26, 2017. ^ "Astros, Dodgers make World Series history with record 8 home runs in Game 2". ESPN. October 26, 2017. Retrieved October 26, 2017. ^ Justice, Richard (October 26, 2017). "Astros, Dodgers author a classic Fall Classic thriller". Major League Baseball. Retrieved October 26, 2017. ^ Gurnick, Ken; McTaggart, Brian (October 25, 2017). "Astros even Series with late HRs in G2 thriller". Major League Baseball. Retrieved October 25, 2017. ^ "World Series 2017: Astros rally to beat Dodgers in dramatic Game 2 – as it happened". The Guardian. October 25, 2017. Retrieved October 26, 2017. ^ a b Hoffman, Benjamin; Waldstein, David (October 27, 2017). "World Series 2017: Dodgers vs. Astros: Game 3 Live Updates". The New York Times. Retrieved October 27, 2017. ^ "Yu Darvish has shortest outing of career in first World Series start; Astros top Dodgers 5-3 in Game 3". The Dallas Morning News. Associated Press. October 27, 2017. Retrieved January 25, 2018. ^ Lauber, Scott (October 27, 2017). "Astros rock Darvish, power their way to 2–1 lead over Dodgers". ESPN. Retrieved October 27, 2017. ^ "World Series 2017 Game 3: Los Angeles Dodgers 3–5 Houston Astros – as it happened". The Guardian. October 28, 2017. Retrieved October 31, 2017. ^ McTaggart, Brian; Gurnick, Ken (October 28, 2017). "Astros use 1–2 punch to take 2–1 WS lead". Major League Baseball. Retrieved October 28, 2017. ^ Justice, Richard (October 28, 2017). 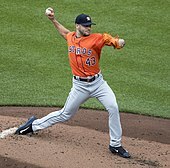 "Peacock's relief performance a Series classic: Astros righty delivers 3 2/3 hitless, scoreless innings for first career save". Major League Baseball. Retrieved October 28, 2017. ^ a b Hernandez, Dylan (October 27, 2017). "Some look askew at Yuli Gurriel's dugout squint". Los Angeles Times. Archived from the original on October 28, 2017. ^ Waldstein, David (October 28, 2017). "Astros' Yuli Gurriel Apologizes After a Racist Gesture Aimed at Yu Darvish". The New York Times. Archived from the original on October 28, 2017. ^ Lauber, Scott. "MLB mulls discipline after Yuli Gurriel's insensitive gesture". ESPN. Archived from the original on October 28, 2017. ^ Castrovince, Anthony (October 28, 2017). "Gurriel suspended for first 5 games in 2018". Major League Baseball. Retrieved October 29, 2017. ^ Lauber, Scott (October 28, 2017). "Yuli Gurriel won't be suspended for any World Series games, MLB rules". ESPN. Retrieved October 28, 2017. ^ Rajan, Greg (October 27, 2017). "World Series Game 4 pitching foes come from Braves stock". Houston Chronicle. Retrieved October 29, 2017. ^ "World Series 2017 Game 4: Los Angeles Dodgers 6–2 Houston Astros – as it happened". The Guardian. October 29, 2017. Retrieved October 31, 2017. ^ Gurnick, Ken; McTaggart, Brian (October 28, 2017). "Dodgers break Astros' home spell, even Series". Major League Baseball. Retrieved October 28, 2017. ^ Verducci, Tom (October 29, 2017). "Historic World Series Home Run Rate may be Result of Slicker Baseballs". Sports Illustrated. Retrieved October 30, 2017. ^ Randhawa, Manny (October 29, 2017). "The top Cy Young duels in World Series history". Major League Baseball. Retrieved October 30, 2017. ^ Hoffman, Benjamin; Waldstein, David (October 29, 2017). "World Series 2017: Dodgers vs. Astros Game 5 Live Updates". The New York Times. Retrieved October 30, 2017. ^ "World Series 2017 Game 5: Los Angeles Dodgers 12–13 Houston Astros – as it happened!". The Guardian. October 30, 2017. Retrieved October 31, 2017. ^ Lauber, Scott (October 29, 2017). "Astros win thrilling Game 5 in walk-off fashion to take World Series lead". ESPN. Retrieved October 29, 2017. ^ a b Axisa, Mike (October 29, 2017). "Dodgers-Astros Game 5: What to know about maybe the best World Series game ever". CBS Sports. Retrieved October 30, 2017. ^ McTaggart, Brian; Gurnick, Ken (October 30, 2017). "Can't make this up! Astros earn insane W". Major League Baseball. Retrieved October 30, 2017. ^ "Most Runs in a World Series Game, Combined". ESPN. Associates Press. October 23, 2011. Retrieved October 29, 2017. ^ "World Series: 11 crazy facts from Astros' insane Game 5 win vs. Dodgers". Usatoday.com. October 30, 2017. Retrieved February 10, 2018. ^ Boswell, Thomas (October 30, 2017). "Perspective | Game 5 of the 2017 World Series was not the best ever. But it was an instant classic". Washington Post. ISSN 0190-8286. Retrieved November 4, 2017. ^ a b Hoffman, Benjamin; Waldstein, David (October 31, 2017). "World Series 2017: Dodgers vs Astros Game 6: Live Updates". The New York Times. Retrieved October 31, 2017. ^ ESPN Stats & Info [@ESPNStatsInfo] (October 31, 2017). "George Springer joins Gene Tenace (1972) as the only players to hit 4 game-tying or go-ahead home runs in a #WorldSeries" (Tweet) – via Twitter. ^ High Heat Stats [@HighHeatStats] (November 1, 2017). "Players to homer in 4 games of a single World Series: Hank Bauer 1958, won series Barry Bonds 2002, lost series GEORGE SPRINGER 2017, ?" (Tweet) – via Twitter. ^ "World Series 2017 Game 6: Houston Astros 1–3 Los Angeles Dodgers – as it happened". The Guardian. October 31, 2017. Retrieved November 1, 2017. ^ Gurnick, Ken and Brian McTaggart (November 1, 2017). "LA solves JV! Dodgers find O to set up WS G7". Major League Baseball. Retrieved November 1, 2017. ^ Stephen, Eric (November 1, 2017). "Joc Pederson ties World Series extra-base hit record". SB Nation. Retrieved November 1, 2017. ^ Gurnick, Ken (November 1, 2017). "LA as confident as can be with G7 at home". Major League Baseball. Retrieved November 1, 2017. ^ "Dodgers, Astros push their wonderful World Series to Game 7". Fox Sports. November 1, 2017. Retrieved November 2, 2017. ^ Normandin, Marc (November 1, 2017). "Astros-Dodgers World Series heads to decisive Game 7". SBNation.com. Retrieved November 2, 2017. ^ McTaggart, Brian; Gurnick, Ken (November 1, 2017). "Houston Strongest! Astros rule the World". Major League Baseball. Retrieved November 2, 2017. ^ a b c Hoffman, Benjamin; Waldstein, David (November 1, 2017). "World Series 2017: Astros vs. Dodgers Game 7 Live Updates". The New York Times. Retrieved November 1, 2017. ^ "World Series 2017 Game 7: Houston Astros 5-1 Los Angeles Dodgers – as it happened!". The Guardian. November 2, 2017. Retrieved November 2, 2017. ^ Stephen, Eric (November 1, 2017). "Clayton Kershaw sets Dodgers postseason strikeout record". SB Nation. Retrieved November 1, 2017. ^ Stevenson, Stefan (November 2, 2017). "Carlos Correa caps World Series with live, post-game proposal to girlfriend". Fort Worth Star-Telegram. Retrieved November 5, 2017. ^ Stephen, Eric (October 21, 2017). "World Series schedule 2017: Dodgers vs. Astros". SB Nation. Retrieved October 23, 2017. ^ Hoffarth, Tom (October 28, 2017). "Hoffarth on the media: Fox Deportes' Nichols fills important role in 2017 Serie Mundial". Daily News. Orange County Register. Retrieved February 11, 2018. ^ Kolur, Nihal (October 24, 2017). "What Channel is the World Series?". Sports Illustrated. Retrieved November 2, 2017. ^ a b c Lucia, Joe (October 24, 2017). "Your 2017 World Series announcing schedule". Awful Announcing. Retrieved October 25, 2017. ^ "2017 World Series draws third-highest viewership since 2005". Awful Announcing. November 3, 2017. Retrieved November 4, 2017. ^ Deitsch, Richard (October 30, 2017). "Game 5 of the World Series Beats Sunday Night Football in TV Ratings". Sports Illustrated. Retrieved November 5, 2017. ^ Paulsen (October 25, 2017). "World Series Game 1 Second-Most Watched Since 2010". Sports Media Watch. Retrieved November 1, 2017. ^ Metcalf, Mitch (October 25, 2017). "Top 150 Tuesday Cable Originals & Network Finals: 10.24.2017". Showbuzz Daily. Retrieved November 1, 2017. ^ Paulsen (October 27, 2017). "World Series Game 2 Third-Most Watched in a Decade". Sports Media Watch. Retrieved November 1, 2017. ^ Metcalf, Mitch (October 26, 2017). "Top 150 Wednesday Cable Originals & Network Finals: 10.25.2017". Showbuzz Daily. Retrieved November 1, 2017. ^ Paulsen (October 28, 2017). "World Series Posts Second-Best Game 3 Audience Since 2005". Retrieved November 1, 2017. ^ Metcalf, Mitch (October 30, 2017). "Top 150 Friday Cable Originals & Network Finals: 10.27.2017". Showbuzz Daily. Retrieved November 1, 2017. ^ Paulsen (October 29, 2017). "World Series Scores Second-Best Saturday Audience Since 2004". Sports Media Watch. Retrieved November 1, 2017. ^ Metcalf, Mitch (October 31, 2017). "Top 150 Saturday Cable Originals & Network Finals: 10.28.2017". Showbuzz Daily. Retrieved November 1, 2017. ^ Paulsen (October 31, 2017). "World Series Third-Best in Decade Entering Game 6". Sports Media Watch. Retrieved November 1, 2017. ^ Metcalf, Mitch (October 31, 2017). "Top 150 Sunday Cable Originals & Network Finals: 10.29.2017". Showbuzz Daily. Retrieved November 1, 2017. ^ Paulsen (November 1, 2017). "Astros-Dodgers Game 6 Among Top World Series Games Since 2004". Sports Media Watch. Retrieved November 1, 2017. ^ Metcalf, Mitch (November 1, 2017). "Top 150 Tuesday Cable Originals & Network Finals: 10.31.2017". Showbuzz Daily. Retrieved November 1, 2017. ^ Paulsen (November 2, 2017). "Over 28 Million For World Series Game 7". Sports Media Watch. Retrieved November 2, 2017. ^ Mitch Metcalf (November 2, 2017). "Top 150 Wednesday Cable Originals & Network Finals: 11.1.2017". Showbuzz Daily. Retrieved November 2, 2017. ^ Skarka, Michael (October 23, 2017). "ESPN Radio to Provide Comprehensive Coverage of the 113th World Series". ESPN MediaZone. Retrieved October 25, 2017. ^ "Dodgers vs. Astros: Your '17 World Series TV Schedule". LATF. October 24, 2017. Retrieved October 25, 2017. ^ Lefton, Terry. "MLB close to selling first World Series presenting sponsorship". Sports Business Journal. Retrieved October 4, 2017. ^ Lefton, Terry; Ourand, John. "YouTube TV Digital Pay Service Signs On To Be First World Series Presenting Sponsor". Sports Business Journal. Retrieved October 4, 2017. ^ Axisa, Mike (November 27, 2017). "2017 MLB postseason shares: Astros to split record $30.42 million". CBSSports.com. Retrieved February 10, 2018. ^ "Houston Astros' title results in $11.4 million baseball loss for Las Vegas sportsbooks in November". Espn.com. December 28, 2017. Retrieved February 10, 2018. ^ McTaggart, Brian. "Houston pays tribute to Astros with parade". MLB.com. Retrieved February 10, 2018. ^ Young, Matt (November 7, 2017). "Astros' Jose Altuve, George Springer make Sports Illustrated cover". Houston Chronicle. Retrieved February 10, 2018. Wikimedia Commons has media related to 2017 World Series. This page was last edited on 13 April 2019, at 01:39 (UTC).